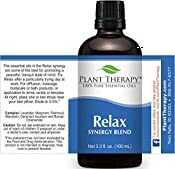 Plant Therapy Relax Synergy (Mental Relaxation) Essential Oil Blend. Blend of: Lavender, Marjoram, Patchouli, Mandarin, Geranium and Chamomile. 100 mL (3.3 Ounce). 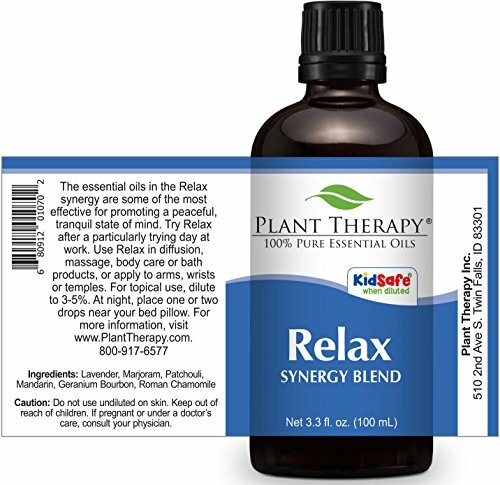 The essential oils in the Relax synergy are some of the best for promoting a peaceful, tranquil state of mind. Try Relax after a particularly trying day at work. Suggested uses: For diffusion, massage, bodycare or bath products, or application to arms, wrists or temples. At night, place one or two drops near your bed pillow. For topical use, dilute to 3-5%. Blend of: Lavender, Marjoram, Patchouli, Mandarin, Geranium and Roman Chamomile. Contains the Pure Essential Oils of: Lavender, Marjoram, Patchouli, Mandarin, Geranium and Chamomile.